The katholikon of the Monastery has the characteristic style of Mount Athos like most of the monasteries in Meteora. The main church is two columned, cruciform with a dome in the centre and two lateral conches on the right and left, the choirs. The dome is polygonic with monolobe windows and predominates the whole elegant monastic complex due to its imposing height. The sanctuary is built towards the north on the grounds of the lie of the rock. The esonarthex precedes the nave and it is covered by a large unified cupola. The church is dedicated to the Transfiguration of the Saviour. However in this monastery the memory of St. Barbara (4 Dec.) is particularly honored and venerably celebrated by the faithful Christians of the area as well. The decoration of the katholikon was made during the abbacy of Arsenios at his own expenses in 1560 (7069 since the creation of the world) almost thirty years after the erection of the monastery as we are informed by the inscription below the representation of the Assumption and above the entrance which leads from the nave to the narthex. The inscription didn’t preserve the name of the painter who must have been very remarkable since the wall-painting assemblages of the post-byzantine art during the second half of the 16th century. These paintings belong to the Cretan School and the narthex as well as the nave are fully decorated. The north wall of the narthex , above the entrance, towards the nave, is covered by the imposing many-figured composition of the Second Coming; high up the preparation of the Throne with St. John the Baptist and Virgin Mary kneeled down on the left and right accordingly and the Christ at the top; below, in the center three angels and the one in the middle is holding the Scales of Justice while the first one is holding a trident. On the cupola is depicted the Pantokrator surrounded by young men and maidens, olders and youngers” glorifying Him. The extended surfaces of the rest of the walls of the nartex illustrate the regular martyrdoms of Saints (Georgios, Demetrios, Nestor, Eugenios, Mardarios etc) as well as full-bodied figures of saints, ascetes and hermits. In the nave above the entrance is depicted the many-figured composition of the Assumption. 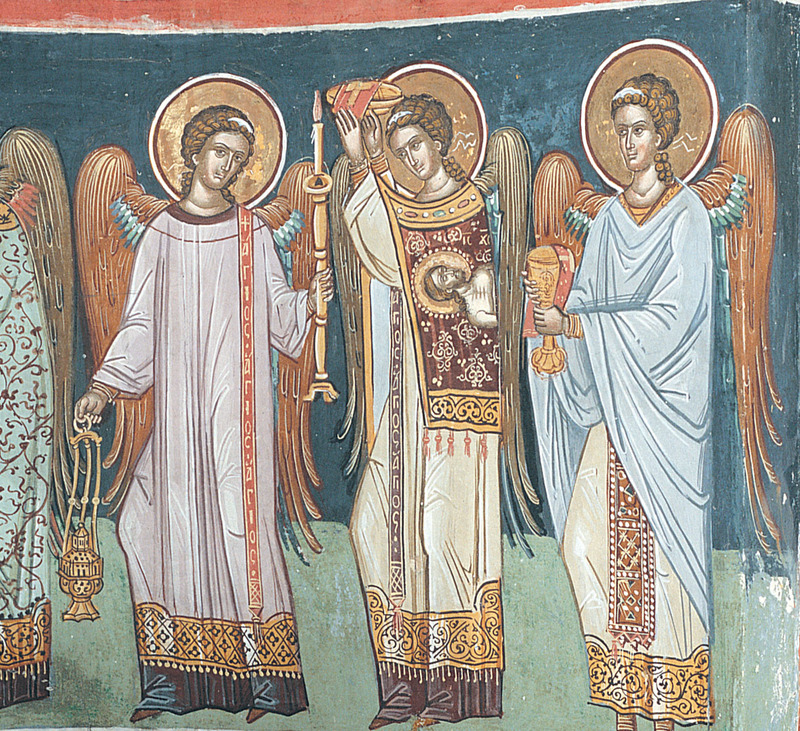 On the right and left of the door, sleepless guards, stand the imposing full-bodied figures of the Archangels of the angelic hosts Michael and Gabriel. On the dome, as it is established, Pantokrator is illustrated. High up the lateral conches, the choirs, there are the Transfiguration, the Ressurection while below there are full-bodied military saints. The rest of the surfaces of the walls are decorated with representations from the Dodekaorton and scenes from the life of our Lord and His Holy Mother. Among the saints illustrated here, there are the great melodoi of our church St. Kosmas “the Godly inspired guitar of the spirit” and St. John Damaskinos “the sweet nightingale”.